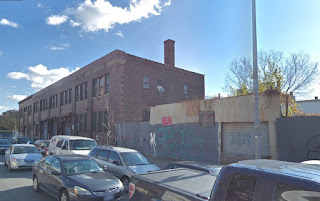 Two proposed mixed-use projects on Pacific Street in western Crown Heights, about three blocks east of of the eastern border of Atlantic Yards/Pacific Park, suggest how development is percolating on industrial blocks used for vehicle storage or light commercial functions. And they're not the only projects. The locations are 1010 Pacific Street and 1050 Pacific Street, both of which are zoned for low-rise manufacturing and will require rezonings to allow for greater density and residential use. 11-Story Mixed Use Building Revealed At 1010 Pacific Street In Crown Heights, Brooklyn, NY YIMBY reported 10/29/18. The 11-story, 115-foot building would contain 128 apartments, 39 of them (25%) permanently affordable for low-income households, with incomes up to 60 percent of Area Median Income, or AMI. 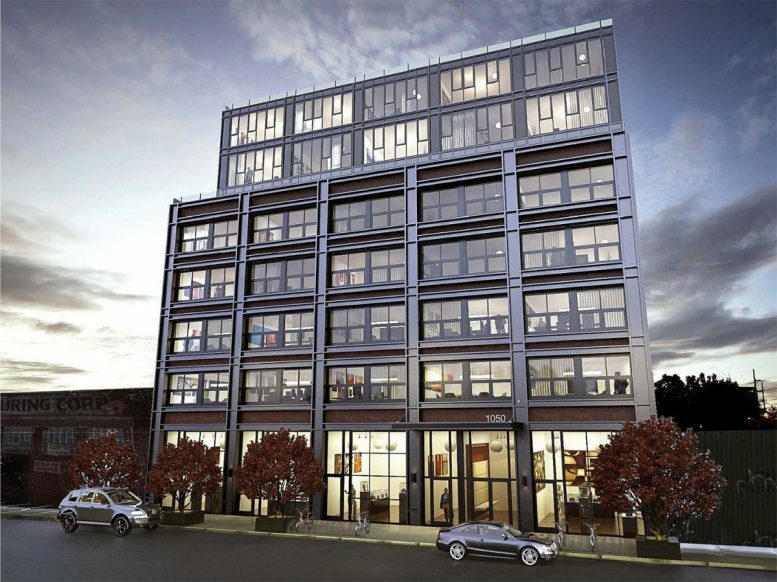 The developer is AVO Construction; in October 2015, LLCs likely connected to AVO--they share the same address--paid $8.5 million for the site. According to YIMBY, the building would have an outdoor terrace, fitness center, and a business workspace on the fourth floor, while the first floor would have a commercial tenant and a community facility--a non-profits arts center plus a garden in back. The architect is Studio V Architecture. There would be below-ground parking space for 61 vehicles. According to the proposed rezoning, the building would have a combined Floor Area Ratio (FAR) of 5.59, with approval of a change to a R7D district/C1-4 district. The current zoning, M1-1, allows an FAR of 1. So this would more than quintuple the allowable bulk. 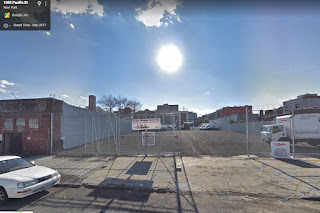 The new building would apparently incorporate a piece of the warehouse at the site, shown at right in a screenshot from Google Maps. According to the Environmental Assessment Statement, the Department of City Planning "has determined that the proposed project would not have a significant adverse impact on the environment." "The proposed rezoning would provide new opportunities for affordable and market-rate housing and commercial development in an underutilized area," states the document, prepared by AECOM. "There is existing residential development within the proposed rezoning area and residential development is a common land use in the surrounding area. The existing M1-1 zoning district is surrounded by residential development in an area well-served by transit." "Considering the time required for the environmental review and land use approval process, and assuming a construction period of approximately 16 to 20 months, the build year for the Applicant’s proposed development is 2020," the document states. "However as the proposed actions are expected to induce development on four projected development sites that are not controlled by the Applicant, an analysis year of 2023 will be utilized for the environmental analyses." "The proposed action would reinforce this trend towards a more active residential mixed-use neighborhood, which is common in the residential areas south of the rezoning area and consistent with 1050 Pacific Street rezoning proposal," the document states. On 10/31/18, YIMBY reported Two-Building Complex Revealed At 1050 Pacific Street In Crown Heights, Brooklyn. The applicant is 1050 Pacific LLC, which apparently purchased the property in foreclosure in 2001 for $281,000. Among the members today--as this document suggests--are Martin Daskal, Harry Daskal, and Hershel Herbst. 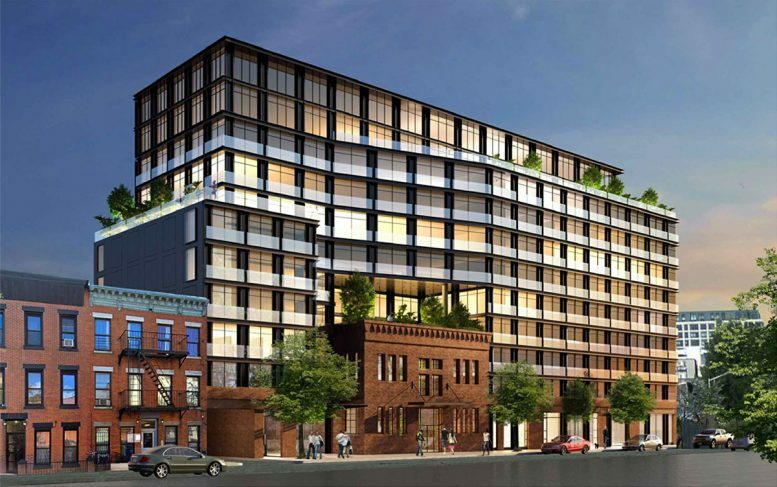 This is another rezoning proposal, with two eight-story (80 feet) towers, with a total of 104 apartments (21 affordable), extending from Pacific Street to Dean Street, with an interior one-story portion. That's the blue outline in the map at left. 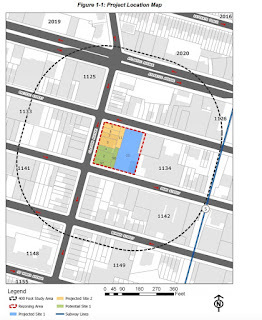 A second building could be built on the development site outlined in yellow, with 55 units (11 affordable), but that property is not controlled by the applicant. The 23,183 square foot lot is presently occupied as storage for Ryder Moving Trucks, as indicated in the screenshot below right from Google Maps. The "Proposed Development is approximately 113,188 gross square feet (not including cellar parking space), with approximately 105,670 zoning square feet (4.56 FAR)," according to the Environmental Assessment Statement (EAS). Cellar level parking, accessible via Dean Street, would provide space for 42 residential spaces and 54 bicycles (2 commercial spaces and 52 residential spaces). The ground floor would be local retail. The project could be finished by 2022. 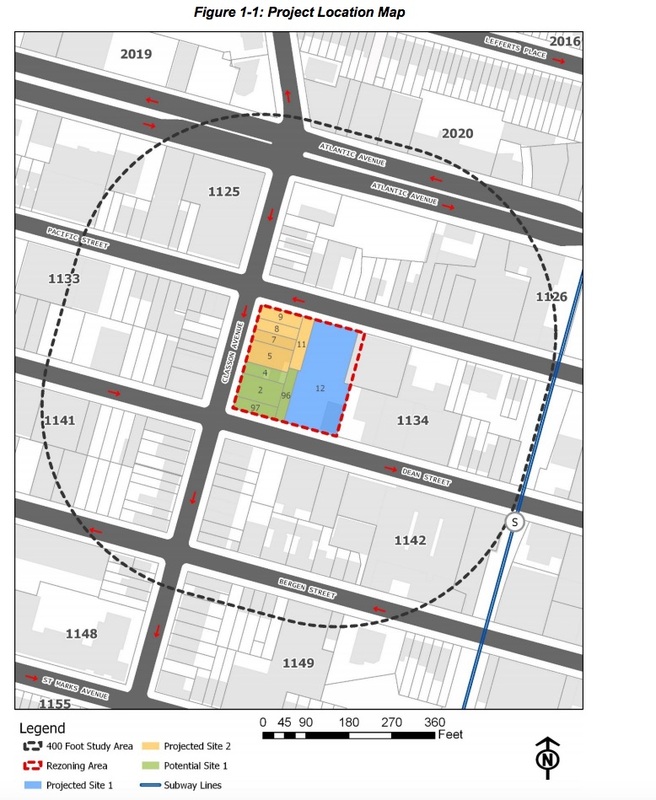 The EAS also makes reference to an additional "Potential Development" in a third rectangular lot, in green, at the corner of Dean Street and Classon Avenue. Pursuant to the Proposed Actions, Lots 4, 2, 96, and 97 could potentially be developed with a 9-story 95-foot-high mixed-use commercial and residential building containing 53,292 gross square feet of floor area. Approximately 44,024 gsf (40,763 zsf) would be residential and 9,268 gsf (8,582 zsf) would be commercial for a total FAR of 4.6 (3.8 FAR residential and 0.8 FAR commercial). Under this scenario, the building would contain a total of 44 units, 9 of which would be affordable at 80% AMI. That site is not controlled by the applicant, either.